Webster Fillmore Goodhue, Web for short, has been doing nothing much at all for the past year or so. Sleeping 15 hours a day and tacking the piss out of customers at his friend Chev’s tattoo parlour have pretty much filled his days since the trauma he was a part of took place. Chev is getting fed up and asks another friend of theirs, Po Sin to help. The help comes in the form of a job offer in which Web will work for Po Sin’s company, Clean Team, which cleans up after nasty, messy deaths. Web unexpectedly takes to the job but his salvation also leads him down a path to near ruin as he becomes caught up with the daughter of a suicide victim whom he cleans up for. The male characters are here are a treat, somehow managing to surprise right through to the end at the same time as fitting the conventions of the noir end of the crime genre. On the surface Web is the standard no hoper so beloved of the genre but he has his reasons for being like he is and as readers learn about them and watch Web try to deal with the hand life has dealt him it’s hard not to grow to like him. Then again I’m a sucker for the sarcastic, well-aimed wisecrack. His friends are the good kind, even if they do choose tough love as their method for helping him out of the various messes he gets himself into. The point is they do help. The role of ‘the girl’ in this particular tale is taken by Soledad, probably the most conventional of the characters and the least well developed but she fulfils the necessary functions of ensnaring Web and performing the odd bit of treachery. I really liked the writing too, especially the dialogue, which is smart, funny and fast: absolutely perfect for the setting and the people. I didn’t notice it was quite so full of crude language until I went trawling to find a section to quote here and realised there was hardly a line to be found without several ‘f’ words. But I think the situations being depicted here – whether that’s yanking the chain of yet another moron wanting a ring of barbed wire tattooed around his arm, having one’s delicate body parts pierced by a sarcastic sadist, cleaning up brains ‘n’ stuff from all manner of crevices or being threatened by certified gangsters on the prowl for almonds – probably all qualify for more than the average amount of swearing. 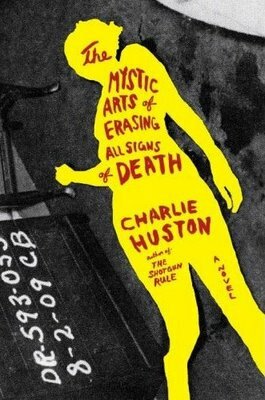 The internet tells me this is Huston’s most mainstream novel and, if true, I suspect it’ll be the only one of his I read. I have a fairly low tolerance for gruesomely described violence and even this book took me beyond my personal limit a time or two. I was happy enough in this instance to read to the end because I was enjoying the main story and the character development but I did find some of the intricately described violence a bit repetitive. For my tastes less of this would have made a better book but I do understand I am in the minority on this; fans of Huston in particular or noir in general probably don’t think there was enough of all that. I only read noir occasionally and generally stick to the comic stuff of which I’d say this is a good example though perhaps not as great as I was expecting based on the many (many) superlative-laden reviews I’ve read. Without a huge number of comparisons to make though I’m probably not the best judge of such things, I just know I didn’t enjoy it quite as much as Plugged, though it was still a very good read and recommended for those who can cope with the violence and swearing. This entry was posted in book review, Charlie Huston, USA. Bookmark the permalink. I like the title but if the violence is only just tolerable I’ll probably give it a miss. Nice to read a review of something a bit different. I loved this one, but am probably bang on the money as a target audience. The dialogue and general noirish, slacker messing made the book for me. The book certainly sounds different, even if it skates on some of the genre cliches. Not sure I’ll read it, as “noir comedy” (ie finding aspects of violence funny) isn’t quite me, but maybe I will. I’ll bookmark it on Amazon anyway – thanks for the review, it’s always good to stretch one’s reading universe a bit. I really find your reviews helpful because you say what you think and pull no punches. I think this is another book I would not enjoy very much. I realize there is some justification for constant swearing in writing about some people, but I can’t get over the fact that it is what I think of as lazy writing. It seems to me that there is always another way to depict a character who can’t form a sentence without the F word besides using it in dialogue. Using that language excessively just guarantees that I won’t read the book, nor will I read anything else by that author. Bernadette – This does sound like a solid example of noir comic. Sometimes I’m in the mood for dark humour. I’m not much of a one for a lot of violence, but maybe I’ll give this a try. Thanks for a top-notch review, as always. I loved this book. Huston is a fine writer, but this is the only book of his that really worked for me – the Hank Thompson trilogy was just too sadistic for me as the hero goes from bad to worse to oh my god what next? Haven’t tried the Joe Pitt vampire series. This book has a curious hopefulness and tenderness about it in spite of the violence (which I don’t really remember – more the main character and his eventual emergence from being completely withdrawn from everything and everyone around him). I do get annoyed by some of his dialogue, which. It’s like. He really mimics speech patterns you know? But then. Yeah. Whatever.